During WW1, Welsh communities offered sanctuary to more than 4,000 Belgian refugees fleeing the outbreak of conflict in Flanders Fields. In the 1930s Basque children from the Spanish civil war were welcomed, and successive waves of conflict victims up to the Syria crisis of today have not only been offered sanctuary, but have contributed to and shaped Welsh society. What can we learn from our peace heritage? Is Wales today a place of peace - and could we be the world's first 'Nation of Sanctuary'? Children's Art Exhibition entry illustrating Syrian Refugee Crisis, Oriel Pendeitch, Caernarfon, Autumn 2016. Destruction of Louvain, 1914; Belgian Refugees welcomed to Rhyl, 1914; Milford Haven Belgian Refugees memorial, 2015. ‘We doubt whether, in the history of Rhyl, such a huge demonstration depicting sincerity and enthusiasm has been witnessed … to excel that which took place on Tuesday afternoon on the occasion of the arrival of the Belgian refugees’. Rhyl Journal excerpt, October 10th 1914. The media excerpt above contrast sharply with the narratives of refugees we see in today's press and tabloids 100 years later, in a time of relative prosperity. Yet in 1914 Wales welcomed over 4,500 Belgian Refugees fleeing Flanders Fields, as the conflict of WW1 consumed their homes; and whilst most returned, we are uncovering today an indelible contribution they made towards Welsh culture, arts and civil society - including the Black Chair of Hedd Wyn, one of most potent symbols of WW1's lost generation. As the European refugee crisis unfolds 100 years later, what can we learn from the past, towards peace today? In Feb 2016, WCIA‘s Wales for Peace project in partnership with the David Davies Memorial Institute at Aberystwyth University launched a call to gather together ‘hidden histories’ of over 4,500 Belgian Refugees for whom Wales became home through the First World War – stimulated by a public lecture by Christophe Declercq, one of the UK’s leading experts on the topic from UCL and the Amsab Institute / University of Ghent, and UK liaison of Belgian Refugees 1914-18. View Wales for Peace / Belgian Refugees in Rhyl Lecture article, 24 May 2016. Spring 2016 Belgian Refugees Storygathering Tour - 'Storify' summary of media and social media coverage. How to find records of Belgian Refugees in the UK 1914-18 (database) and Finding Belgian Refugees in Wales – article by Lorna M Hughes. How did Britain handle its biggest wave of refugees ever? BBC iWonder Guide, 2014 accompanying R4 'Home Front' series. Trawsfynydd, Gwynedd - the Black Chair of WW1 War Poet Hedd Wyn, carved by Flemish carver Eugene van Fleteren. Menai Bridge, Gwynedd - the Belgian Promenade, built 1916 as a gift from the refugees of Mechelen to the people of Bangor area, and blog piece. Llanwenog, Ceredigion - A Wartime History Recorded in Wood Carvings (BBC Feature) by WW1 Belgian Refugee and leading wood-carver Joseph Reubens; Download Church Guide. Milford Haven & Tenby - building on centuries old ties between Pembrokeshire and Flemish fishing communities - with an existing local population before WW1 - Milford accepted over 1,000 refugees following the outbreak of war. View Belgian Refugees 14-18 Blog, Belgian memorial, Laugharne Memorial, and call for Hidden Histories. South Wales Valleys - 'A Welcome in the Hillside' Blog Piece. From 1900 to 1923, various Turkish regimes systematically killed over 3.5 million Armenians, Greeks, Nestorians and other Christians. At the time Britain was at the forefront of calls for justice for this genocide; the word ‘genocide’ was coined by a Jew, Raphael Lemkin, with the Armenians uppermost in his mind. However, In Turkey it remains a crime to use the term when describing the events of 1915 that saw nearly 1.5m ethnic Armenians murdered - more than 75% of Armenian people. In Wales, a small but thriving Armenian community remains, and in 2015 marked the centenary with a ceremony at the Armenian Genocide Memorial in Wales' Peace Garden at Cardiff's Temple of Peace (memorial dedicated in 2007). In September 1936 General Franco, against the elected Republican government, called on German and Italian allies to help establish a dictatorship, bombing his fellow countrymen - a terror immortalised in Picasso's painting 'Guernica', a copy of which hangs in Cardiff's Temple of Peace. From the northern Basque Country in particular - whilst many fought and were supported by Welshmen in the International Brigades - tens of thousands were forced into exile. In one of the biggest mass evacuations of modern history, some 4,000 children were packed on ships bound for Britain at the outbreak of the Spanish Civil War. Some were sent on the S.S. Habana from Bilbao to Southampton, from where - organised by the National Joint Committee for Spanish Relief - 400 children were taken in by 4 areas in Wales: Brechfa in Carmarthenshire, Sketty in Swansea, Caerleon near Newport, and Old Colwyn in North Wales. The Kindertransport (German for "children's transport") was an organised rescue effort that took place during the nine months prior to the outbreak of the Second World War. The United Kingdom took in nearly 10,000 predominantly Jewish children, of whom many were accommodated by Refugee Children's Movement local committees in rural North and Mid Wales (Colwyn Bay, Rhyl, Llandudo and Bangor, Aberystwyth, Builth Wells, and Llandrindod) as well as South Wales' urban centres such as Cardiff, Swansea and Newport. Hereford and Llanwrtyd Wells, Powys - Barbara Winton's book "If it's not Impossible... the Life of Sir Nicholas Winton" (Guardian Book Review, June 2014); the 'British Schindler' at 105: the man who gave 669 Czech children the 'greatest gift'; Holocaust 'hero' Sir Nicholas Winton dies aged 106. "Organised by banker Nicholas Winton, over 130 Czech-Jewish children were transported to the small Welsh town of Llanwrtyd Wells in 1943. Educated in English at the makeshift school in the Abernant Lake Hotel, the community became a home for many of these children, acting as both a source of happiness during war and as solace when news of murdered loved ones arrived. Many returned to the town as adults (several having become naturalised British citizens) to erect a seat in honour of Joe Jones (a local shopkeeper who drove the children to sports events because they had no parents of their own doing so), plant a maple tree, and place a plaque stating ‘Llanwrtyd Wells, the smallest town in the land remains the greatest in our hearts.’ In 1985, descendents presented mayor Bryn Jones with a gold link, the first in the mayoral chain. In 2015 the people of Llanwrtyd Wells organised a visit to their twin town Český Krumlov in the Czech Republic. Llanwrtyd Wells is noteworthy for illustrating the type of connections formed during the war that endure across the decades into present day." Excerpt from Welsh Jewish History WW2 Blog. Over 6,000 descendents are alive in 2016 from the quiet work of Nicholas Winton, touchingly celebrated in 1988 by Esther Ranzen's "That's Life" episode (clip below); and many thousands more from the efforts of individuals and communities throughout Wales. In the decade following World War 2, many millions of people remained displaced throughout Europe, and the newly formed United Nations Association at Cardiff's Temple of Peace played a lead role in shaping Wales contribution to the UN's refugee and resettlement programmes. The origins of today's UNA Exchange, the UNA International Service and local Peace Corps through the 1950s recruited and placed young and skilled volunteers on exchanged throughout Europe. By 1958 there were more than 650 UNAIS volunteers working through their summer holidays in European work camps. More than ten years after the Second World War had ended, many thousands of refugees were still living in temporary wooden barracks that housed German soldiers. 1959 was designated World Refugee Year, the first ever UN International Year and one million pounds - a vast sum of money then and far greater than any previous public effort - was raised in the UK. With other world-wide funds and the work of the UN High Commissioner for Refugees (UNHCR) all the Second World War refugee camps were cleared in the course of the decade. Robert Davies was one volunteer placed to Austria in 1960-64, and who has written a book 'All Together - a personal experience of international voluntary workcamps' which we hope to digitise in full on People's Collection Wales in Summer 2017. Robert went on to found VCS, Britain's first volunteer bureau in Cardiff (listen to his story on Radio Cardiff Chronicle here), and was also the founder of Wales' Garden of Peace. On August 5th 1972, Ugandan President, dictator Idi Amin issued a chilling message that would turn lives upside down forever. Thousands of Asians were to be expelled from Uganda, given 90 days to get out - leaving everything behind. In all, almost 30,000 Ugandan Asians came to the UK and went to 12 resettlement camps nationwide. 1,000 were taken in by the small Gwynedd community of Tonfanau on the Snowdonia Coast. Cardiff, Newport and Swansea have some of the UK's oldest multicultural communities, from the 1880s when opening of the Suez Canal opened coal trading by sea with the bunker ports of what was then called the British Somaliland Protectorate and the Gulf of Aden (now Yemen). Today, the deep and established communities of 6th generation descendents have not only offered sanctuary to refugees fleeing the Somali Civil War - which has ravaged the failed state of Somalia since 1988 - but have also played a pro-active role in supporting peace, stable government, development and recognition of modern Somaliland since 1991. Vietnamese boat people refers to almost 800,000 refugees who fled Vietnam by boat and ship after the Vietnam American War, especially during 1978 and 1979, but continuing until the early 1990s. Many hundreds left Vietnam in the flimsiest of craft, trusting their lives to the waves and the humanity of others as they fled the change of regime following the 'fall of Saigon'. Welsh communities played their part. Penygraig, Rhondda: Vietnamese orphan given a home in Wales goes back to his roots (Wales Online, 2013). Le-Thanh was one of 99 babies rescued as part of 1975’s Operation Babylift in the dying days of the Vietnam War, and found himself in the care of Canon John Thomas and his wife Binkie at their home in Penygraig, Rhondda. In Wales, whilst media attention has tended to focus on the Syrian Resettlement Programme, most urgent human need continues to be focused on spontaneous arrivals in the traditional dispersal areas of Swansea, Cardiff, Newport and Wrexham. But many communities have opened their doors in sanctuary. Building on Wales' peace heritage of offering sanctuary to refugees through the last 100 years, Welsh Civil Society were early to set up 'city of sanctuary' movements - where local people and communities work together to make their cities a place where new arrivals are welcomed, and can begin to feel safe from war and persecution. Swansea became the UK's 2nd City of Sanctuary in 2010, followed by Cardiff in 2014. Sanctuary Seekers in Wales - Critical Reflection article by Alyda Payson from 'A Tolerant Nation?' by Charlotte Evans, Neil Evans and Paul O'Leary 2015. Images of Refugees at Sea - Critical thinking blog on use / misuse of images from history to provoke hostility / sympathy towards refugees today. Making Wales a Nation of Sanctuary - Oxfam Cymru Campaign Blog, April 2017. Welsh Govt Equality, Local Government and Communities Committee Report on Refugees and asylum seekers in Wales, April 2017 and in News. Contribute directly to the KAFKA 'Wales Nation of Sanctuary' Story Gathering: We would like to collect experiences of people from across Wales on how you or your community has welcomed and supported refugees and asylum seekers; or how you have been welcomed into a local community as a refugee or asylum seeker. We want to capture experiences and help build connections to create a movement of people all working to make Wales a more welcoming nation. 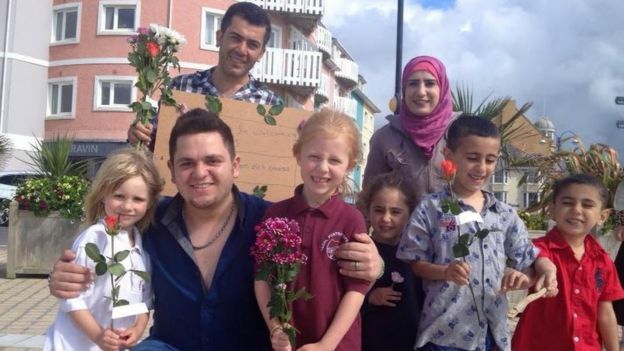 Is Wales today a place of peace for those fleeing conflict? And what for Welsh internationalism and European mobility in a world beyond Brexit, and for future generations?